Whole day workshop demonstrating how to use Lean Manufacturing, Supply Chain and Six Sigma Basics to deliver World Class Goals. Participants are divided into groups and assigned roles in a mock company. Facilitated challenges are presented coupled with Lean Six Sigma Training concepts. For more information on how these simulations can aide in the development of your program, contact the VIPGroup. “Personally, I think the Business Simulation Training is one of the most effective methods I have participated in that makes a difficult concept easy to understand, and fun to learn. 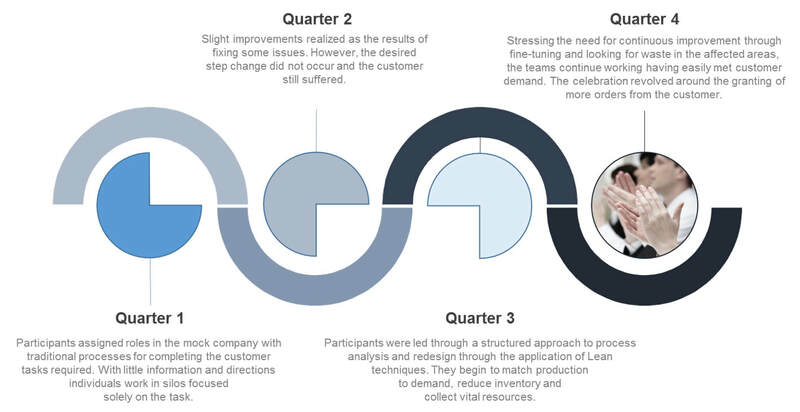 The whole process to team-based continuous improvement and learning is constantly reinforced in the day-long exercise. Sometimes it is difficult for office and floor associates to see how their work impacts meeting customer needs, but this training really brings to light the issues and the “ahas” in our process. Most people can relate to value-adding and non-value adding, but have a difficult time seeing their role in fixing the issues. Our experience has been that it is a very successful way to kick-off a major change initiative and getting folks thinking differently about their roles and their work. A powerful, yet simple tool that works well”. “Business Simulation is a great session for anyone who is planning to go from a random batch way of manufacturing a product to a more streamlined process. When you get the chance to brainstorm with your fellow employees and you really see how these changes benefit all parties – the employees, the shareholders (lower costs, quicker turnover in your product & quality improvement) and your very satisfied customer – it’s great! What is important is to keep in mind when you go back to your “real world work” these chances take time, input from employees is important and in the end, everyone is happier with the way things work”.